(Nanowerk News) Engineers at The Ohio State University are working to improve manufacturing of nanoparticles for biomedical applications. The research, if successful, will result in faster production times of more uniform particles at a lower cost, and ultimately lead to improved diagnostic capabilities. Ohio State was awarded a four-year $1,174,000 grant from the National Science Foundation to establish new methods and equipment for the continuous manufacturing of nanoparticles. One of the biggest challenges preventing wider use of many nanoparticles are current manufacturing processes, which are expensive, energy intensive and produce low yields. Ohio State researchers believe their new continuous manufacturing process could be the solution. Unlike current manufacturing strategies that use emulsion-based approaches for nanoparticle synthesis, the proposed new synthesis method combines an energy-efficient electrospray—a top-down continuous spraying process—with self-assembly—a bottom-up process that occurs spontaneously. Chemical and Biomolecular Engineering Professors Jessica Winter, Lisa Hall and Barbara Wyslouzil. Core Quantum Technologies, an Ohio State spin-out company founded by Winter, and Quad Technologies, a Northeastern University spin-out led by Brian Plouffe, will collaborate with Winter’s team to evaluate the functionality of nanoparticles manufactured by the new process. The research will focus on the continuous manufacturing of three nanocomposites with strong potential for applications in biomedical imaging, clinical diagnostics and pharmaceutical separations: composite magnetic nanoparticles, composite quantum dots and magnetic quantum dots. “Because these particles emit brighter signals, they should permit disease to be detected more easily,” said Winter. In addition, this technology is one of the enabling tools for personalized medicine. It permits many markers to be evaluated simultaneously, so physicians can determine disease sub-variants or follow response to treatment and adjust accordingly. The same approach could be also used to manufacture other nanocomposites, which could impact a diverse range of fields, including electronics, optics and energy. 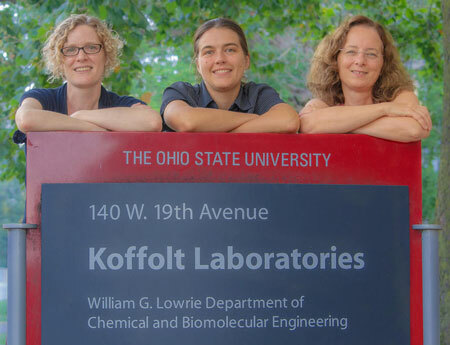 The research team includes two additional Ohio State faculty, Barbara Wyslouzil, professor of chemical and biomolecular engineering, and chemistry; and Lisa Hall, assistant professor of chemical and biomolecular engineering. Team member Carol Lynn Alpert, director of strategic projects at the Museum of Science in Boston, will ensure that societal, ethical, environmental, health and safety considerations are integrated into the process design as it is being developed. This new process builds upon previous Ohio State research, already patented and licensed by Core Quantum Technologies, which created a semi-continuous process of manufacturing nanoparticles. As part of the grant, local non-profit Edheads, directed by Gail Wheatley, will design a software platform that describes the commercialization process and focuses on female entrepreneurship in particular.